I wanted to start a new series similar to the Designers to Watch. It is called Boutiques to Know. There are a ton of independent plus size boutiques out there that cater strictly to you. They carry from the mainstream to the indie designers. A lot of the owners are plus size and more than just a business, helping their customers look fabulous is a passion. First on deck is blog supporter, My Curve Appeal. This boutique hovers on the outskirts of Atlanta, GA and it was actually one of my first jobs as a indie buyer. 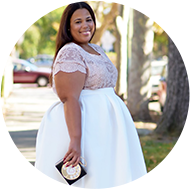 This boutique carries plus size fashion, but the most special about this boutique is that they have plus size gown samples for weddings, proms, and bridesmaid that you can actually go in the store and try on. I WISH I had this option here in Dallas when I was in search of a wedding gown. I had to eyeball my gown instead of being able to try it on first. You can check them out here. Sometimes I find that item that I thought was sold out. Brands sell to boutiques too, so the item may be sold out on their site, but the boutique could still have the item in stock. Items are generally always in stock so there is no wait time. With indie designers there may be a processing time. Boutiques offer the inventory they have, so items can be shipped immediately. They look out for you! Most of the boutique owners I know are plus size, so they really care about the options that they bring to you. They are not a huge corporation, none of which know what it is to be plus size, amassing together trying to figure out what you want when they really have no clue. They generally have great selections of pieces they scouted out just for you! Love this post, shout out some of your favorite indie boutiques. Great Post!!! I need to locate more Plus Size boutiques in the Los Angeles area. I like Avenue, Lane Bryant and Ashley stewart, but I'm looking for unique pieces and I know that boutiques will have those! Thanks for this post, inspires me to really get out there ad look for local boutiques and reach out to boutiques outside of my area such as My Curve Appeal. In your area there are a lot of indie designer lines. LA is great place for plus size clothing.